The classrooms at Solihull’s new Learning and Development Centre are abuzz with colleagues learning new skills. But setting it up on a tiny budget has been no mean feat as AME and Business Excellence found out. In true Project Charge fashion, Solihull’s Business Excellence team stood up to the challenge to develop a brand new training centre. Lode Lane's new home for manufacturing based learning, including the new Group Leader Academy, saved more than £75,000 in the process. It was a true testament to some of the great friendships at Solihull and the willingness to help each other out when times get tough. 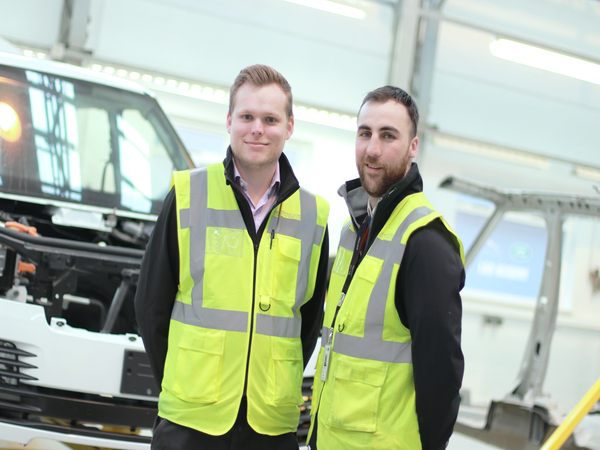 Oliver Miller and Billy Mullan from Advanced Manufacturing Engineering construction worked side-by-side with the Business Excellence team to try and save every penny. It wasn’t just on construction where money was saved. In the end, thanks to more Solihull thrifty spirit from Scott Giblen and Shoaib Ali, the team managed to borrow spare projector screens and an old coffee machine for the Escape Room. Faye adds: "A star addition in the new centre is half of an old Range Rover, which was used for a quality skills training area - a huge thanks must go to Matt Moore, Matt Walker and Andrew Height for working their magic with this." Over the coming years, thousands of Solihull colleagues are set to pass through the doors of the training centre and as the saying goes, it you look after the pennies, the pounds will look after themselves - over £75,000 in this case. The team are looking forward to the challenges that lie ahead and are looking for other unused equipment/furniture that can be upcycled to a functional purpose whilst inspiring others to do the same. Please email IPSSOL@jaguarlandrover if you have any items you think might be worth upcycling.